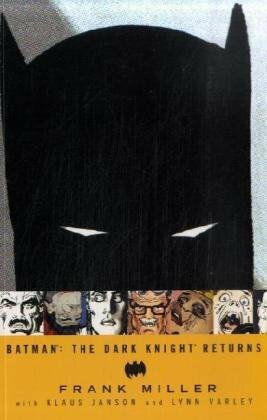 A friend once said that all you need as moral guides on this earth are The Dark Knight Returns, Kingdom Come (another graphical novel) and the Holy Bible. While I would probably omit the latter and include the Meditations of Marcus Aurelius or Plato’s Republic I can surely concur with the first two selections as being critical in developing a tempered moral compass. While this might come off as an exaggeration, it is only barely – the three works offering quintessential guidance in times of befuddlement while also offering inspiration to trudge forward in times of injustice and betrayal. All the great questions of life are encountered by the protagonists and a righteous code of ethics is codified in response, inspiring the reader to be greater than what he was before by observing the examples of heroic conduct and so being transformed. The Dark Knight Returns is by the standards of today primitively drawn and inked, but this fact is irrelevant as the graphics are well enough to keep our interest drawn to the engrossing moral lessons and satire. Each page of this precious work is chocked full of words and intelligently written dialogue, historically serving as the first serious “graphic novel” – an expanded literary comic that was intended to be read by adults and to have included in it serious subject matter. While most comics are centered around the plates (the art), graphic novels were supposed to be primarily stories, with the artwork intended to support and not overshadow the core writing, all originally starting off as novellas rather than storyboards. This being said, I will not hover too indulgently over the topic of the art – which is presented in stark, grimy, dark, vile environments, contemptuous caricatures of pop culture figures and lingering, desolate existential stages. The story focuses on the question of what justice is while also (perhaps more importantly) criticizing the irrationally bellicose cold war climate and its corresponding destructive materialism, untempered indulgence and superficiality, issues which are very much still afflicting our society today as we rot in the wake of renewed imperialism and corruption. Bruce Wayne is presented not as a flawless super hero but rather as a broken and doubting latter-day Cincinnatus being summoned to once more repel the enemies of justice and civilization. Labeled a vigilante terrorist by the police and ostracized as a dangerous and unstable sociopath by the morally bankrupt public and their “expert” talking heads, the Batman heroically serves an ideal of justice in hopes of restoring reason and truth to a diseased, collapsing society bent on global nuclear destruction, all while expecting no reward and never abusing his power. Through Bruce Wayne’s selfless sacrifice and devotion, the people of Gotham City are inspired by example to off their complacency and take back their city from the drug dealers, pimps, corrupt officials, thieves and rapists, all the while developing a sense of fidelity and brotherhood to one another. Ultimately The Dark Knight Returns is about the proper conduct of a human being: even though the people around you may be corrupt and morally bankrupt, and even though they may have surrendered their faith to denial and apathy, and abandoned their community – a true man does not, even if he must be stabbed by a thousand blades in a day or swim through a lake of fire. While Bruce Wayne at times feels that his efforts to bring order to the lawless and miserable Gotham City are futile he continues to do what is just and good, in the face of all possible rejection and criticism. The reward for acting like a human being is not riches, or fame, or even respect of your peers, but rather the fleeting satisfaction in knowing that the people left in your wake would have been treated justly, and maybe, just maybe, would so be inspired to treat others with justice, breeding a righteous culture.